Two of my beaded items have been awarded prizes in 2009! 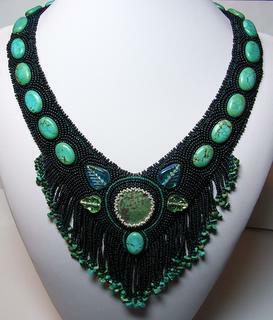 My bead-embellished neckpiece “Turquoise Treasure” was selected as the Grand Champion Craft Exhibit at the Royal Canberra Show in February 2009. This was a huge surprise (and thrill) for me, and it was the first time an item of jewellery has received this accolade at any Royal Canberra Show. The Grand Champion Craft Exhibit is selected from the overall champion exhibit from each of the 22 craft categories in the Craft Expo at the show, including woodwork, needlework, quilting, lapidary, beading, felting, etc. “Turquoise Treasure” has also won First Prize in the Threadwork category of the Beading section at the Sydney Royal Easter Show (March 2009). On March 26th 2009 I went to the opening of the Goulburn Art Award exhibition at the Goulburn Regional Art Gallery. I had entered my other bead-embellished neckpiece “Natures Treasures” in this exhibition, though with no expectations. This is the first time I’ve entered anything in this exhibition/competition. I was actually quite shocked when my name was read out amongst the winners…..my neckpiece won joint first prize in the 3D category. It is true – and amazing – that I was actually lost for words when my name was announced! The judges were Ben Quilty (an artist who has won various prizes for his work, and his portrait of singer Jimmy Barnes was a finalist in this year’s Archibald Prize), and Helen Maxwell who runs the Helen Maxwell Gallery in Canberra – a highly-regarded gallery which often features cutting-edge artworks. The prize for the three prizewinners (winner of the 2D category and the two joint winners of the 3D category) is an exhibition of our works at the Goulburn Regional Art Gallery in December 2010. Looks like I’ll be pretty busy over the next 18 months or so creating a body of work for this exhibition. My head is already buzzing with creative ideas for this exhibition. I am so happy to have this wonderful opportunity to exhibit my work. In these more challenging economic times, regular holidays and overseas trips can break the budget. Why not try a different kind of holiday – a holiday for your creative soul! Imagine relaxing in a quiet rural setting, while experiencing the joys of beading onto fabric. This special creative retreat is available for the absolute recession-buster price of $485 (or $450 early bird rate – if paid in full by July 31st, 2009). Cost: $485 per person, or early bird rate of $450 per person if paid in full by July 31st, 2009. A $50 deposit is requred to hold your booking, with full payment due by Friday August 21st, 2009. Deposits can only be refunded if your place is cancelled prior to August 21st. If the workshop is cancelled due to lack of numbers (i.e. if less than 5 people book in), all deposits paid will be refunded. Please note: I have no credit card facilities, so payments must be made by cheque or money order. At the retreat, purchases can be paid for with cash or cheque. This retreat is for 5 participants only – no more, no less (the Cottage accommodates 5 people only), and runs for 5 days, and I’m your teacher, friend and guide for the full 5 days, hence “Fiona’s Fivers”. Day 1: Bead embellishment basics: including techniques such as seed stitch, beaded backstitch, bead couching, bead fringing (regular and branched), bead stacks, picot edging, peyote beaded bezels (around a cabochon), plus information on suitable fabrics, interfacings, beading threads, beads, etc. Days 2 and 3: Taking it further – Textural and 3-dimensional beading effects: incorporating various beading techniques such as brick stitch, herringbone stitch, ladder stitch, netting, freeform right angle weave, etc. and how these can be used in bead embellishment onto fabric, plus creating texture through bead placement and size variations, etc. Days 4 and 5: Stepping out – Beading the Void: Use skills and techniques already covered in the first three days, plus some new ideas, to create beading of various kinds in the void (in the ‘holes’ in textiles of various kinds). Participants have the option of creating numerous samples incorporating all techniques covered in the retreat, or working on beading for specific projects (patterns for several projects – e.g. evening purse, A5 journal cover, mini wall hanging – will be available from Fiona during the retreat, for a nominal extra cost). Whether you have had some beading experience or have never even picked up a bead, this workshop is for you. All you need is the desire to learn bead embellishment, and the ability to use needle and thread. More information, including photos of samples and registration forms, will be available by late April as PDF files – please contact me via email and I will send them to you. Or you can contact me by phone or email (phone (02) 4849 4489, or email fiona@chiatanyadesigns.com.au) to discuss the retreat or make your booking. Please mark your emails with “Fiona’s Fivers”. This is partly a self-cater retreat, i.e. participants need to bring their own breakfast and dinner requirements, other than dinner on the first night. The cottage has a kitchen with upright gas stove/oven, plus a microwave, and there is a gas BBQ just outside. Crockery and cooking utensils are provided. The cottage is a 3-bedroom building – there are 2 bedrooms with queen size beds, plus a more open-plan bedroom area with 3 single beds. The shower and toilet are shared facilities for all 5 guests. Bed linen and towels are provided. The cottage is on one level, though there are three small steps leading to the door. There is plenty of parking just outside in the yard. All classes will be held at the cottage, in the lounge/dining area. Trestle tables and chairs will be provided. There is no mobile phone service on our property – though you can walk about 1km east (back along our road) and get some signal. There is also no TV reception at the cottage, though there are video and DVD players to use with the TV. Down Under Quilts magazine, issue 125 (October 2008) features a profile on me and my quilts. It shows colour photos of about 12 of my quilts. Down Under Quilts magazine, issue 128 (January 2009) features my project “Raspberry Lime Splice Quilt”, which is another example of my Curvaceous Squares quilt technique. The same issue also has my how-to article on needle felting (using a needle-felting machine). 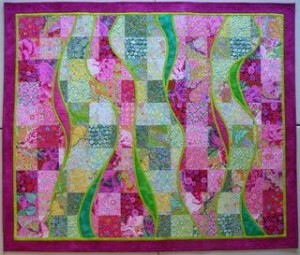 Following the publication of my project “Raspberry Lime Splice Quilt” in Down Under Quilts magazine issue 128 (January 2009), I am now taking bookings to teach my two-day workshop “Curvaceous Squares Quilt” (the magazine project is based on this technique). RECENT BEADING AWARDS: At the Royal Canberra Show in late February 2008 Fiona’s jewellery pieces received several prizes and awards. 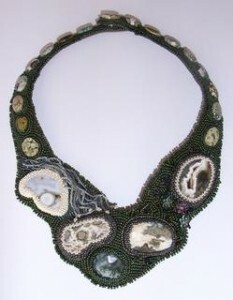 Her heavily bead-embellished neckpiece “Nature’s Treasures” won first place in this year’s theme category “Planet Earth” and also received the Overall Reserve Champion ribbon for the Beading section of the show. Her bead-embellished earrings won first prize in the Professional Earrings section, and her necklace “Cool Ripples” won first place in the Professional Necklace section, and also received the Champion ribbon for the Professional category of the Beading Section. A second place ribbon was awarded to her “Lunar Lace” necklace in the Professinal Necklace category, and her jewellery set “Toffee Crackle” won first place in the Professional Jewellery Set category. Fiona’s “Nature’s Treasures” neckpiece and “Silk and Spirals” necklace were finalists in the 2008 Bead and Gem Show competition, and were seen at the Sydney Bead and Gem Show. Fiona’s small wall quilt “Botanical Oddity” has done very well at the Canberra Quilters Inc. annual exhibition in August 2008. It was awarded the Down Under Quilts Best Use of Colour Award – a very prestigious award and one that Fiona has dreamed of winning for many years, though this is the first time it has happened. 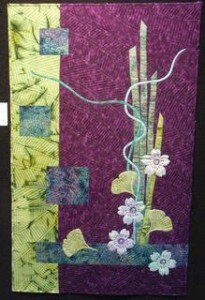 This quilt also came second in the Mixed Media category, and won the embellishment award. The quilt measures 50 cm x 54 cm, and features extensive bead embellishment on the flower petals, and has dry needle felting (done with special needles on a Bernina sewing machine) around the edges of the petals. Extra pieces of this felting were created on water-soluble stabliser, then placed at the flower centre, and attached to the quilt with beading. The background of the quilt is hand-stitched with variegated silk yarns to add texture and light to the quilt. Down Under Quilts magazine profiled Fiona in the October 2008 issue (issue 125). At the Royal Canberra Show in February 2008 Fiona’s quilt “Ikebana” won first place in the Professional Quilting section, plus the Champion ribbon for the Professional section, and it also received a prize for the Overall Champion of the quilting section of the show. Fiona’s mini quilt “Flower Paua” came first in the Professional Textiles category, and also received the Reserve Champion ribbon for Professional Textiles. How about this for an idea: Get yourself and 4 friends together and choose from Fiona’s list of workshops (see the pages on half-, one- and two-day workshops). Then contact Fiona to arrange a suitable weekend (or weekdays) for your very own Rural Retreat Workshops. How often do you get to tailor your own creative play time to your needs like this? “Burst of Colour” Ring project appears in Vol. 3.2 (April 2009). This ring is such fun to make – you’ll want to make several in various colours. The ring is made with even-count peyote stitch, and the leaves are created with a variation on regular fringing. “Zigzag Diamonds Bracelet” project appears in Vol. 3.1 (February 2009). This project features my variation on the traditional zigzag chain technique, plus a special clasp created with a square variation of circular peyote stitch. “Midnight Moonlight Choker” project appears in Vol. 2 no.5 (October 2008). This project uses one of my current favourite techniques – St Petersburg Chain, with a variation I came up with to join the double chains together to allow them to drape vertically. It feels beautiful to wear. It features size 10 Delica beads, size 9 seed beads and gorgeous little fresh water rice pearls. My design for this project is based on my “Ode to Maria” necklace which I designed and created in September/October 2007 for the Maria George 50th anniversary competition (it was awarded a Highly Commended). “Diamond Drops Earrings” project appears in Vol. 2, No. 4 (August 2008). This quick and achievable project is designed to teach you two threadwork techniques – brick stitch and fringing. You’ll use brick stitch to create a triangle, then add fringing to mirror this shape and complete the look with small drop beads. The result is a pair of diamond-shaped earrings with plenty of bling. Look out for my projects in each issue of Australian Beading magazine – the June issue has my “Colourful Streamers Necklace” project, which is made with square stitch, and is a vibrant colour pick-me-up for winter. The August issue will feature a special project of mine as that issue’s Masterclass Project. Issues #17 (May/June 2008) and #18 (July/August 2008): “Elegance” Necklace (intermediate project featuring seed beads with brick stitch, right-angle weave with criss-cross embellishment, and regular fringing). The original necklace, which was the inspiration for this project, can be seen on Fiona’s Gallery page. Kits for this project are $35 – $45, depending on quantity of beads required. Kits for both these projects are available. Contact Fiona for prices and ordering information. Website by Dynamic Web Solutions. WordPress theme by Kaushal Sheth.